Thanks so much for inviting me to be a guest blogger. I started quilting in the traditional way over 25 years ago – all by hand. I think it all starts when you become a mom – at least that’s how it was for me. I had this little baby (Heather) and I had this itch in my fingers to do something creative. I started with some cross stitch blocks that turned into a quilt and I haven’t looked back since. I’ve done tons of different styles (see more on my web site) – traditional sampler, hand appliqué, kaleidoscope quilts… and then I started trying some non traditional things – freeform appliqué (without a pattern), layered quilts (actually several little quilts on top of one another), and then I developed a really cool technique of capturing things under tulle (kinda like shadow quilting, but with a sheerer top layer and capturing lots more than cut fabrics). 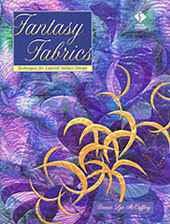 This lead to my first book "Fantasy Fabrics" which is now out of print. In the "Fantasy Fabrics" book I explored all of the different things that could be captured under the tulle (cut fabrics, ribbons, threads, yarns, sequins, Tintzl, and LOTS more). The technique is great because you can make complex looking quilts (with tight curves and sharp points) quickly and easily. After covering everything with a layer of tulle, the layers are stitched together with invisible thread. One chapter of the book covered captured artificial flowers under the tulle. WOW! Now you can make floral quilts really quickly and easily. 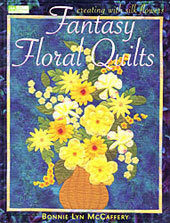 And that lead to my second book "Fantasy Floral Quilts" – which is also out of print, but we do have a few copies left. I became fascinated by quilts with people in them. I have no formal art training, but I decided one day to try painting a face. I wanted to do it really easily (and make it so that other people could do it), so I traced a photo of a face and put the tracing beneath the fabric. Now I knew exactly where to paint each of the features. 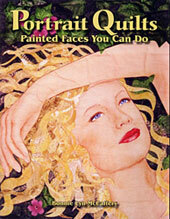 Well this lead to the next book "Portrait Quilts: Painted Faces You Can Do" also out of print. But I am excited to announce to you first that we are reprinting a limited number of this book which should be available in late February. The "Painted Face for Beginners" has been one of my most popular classes. People are amazed that they really can learn to paint a face. What amazes me is that they sign up for a class that they don’t think they can do – but they always go away tickled that they really could paint a face – and now they can add faces of their loved ones to their quilts. I love traveling and teaching. I’ve been to England, Ireland, Scotland, France, Sweden, Denmark, Canada, Curacao and throughout the US (although I’m still missing some states). But I knew there were people who might not be able to get to my workshops. So I began experimenting with video. I wanted to learn everything I could about video. I also bought an iPod and discovered Podcasts (like radio shows you could download onto the iPod). And even better yet were Vidcasts (mini TV shows that could be downloaded to the iPod). There weren’t any Vidcasts on quilting and I wanted to be the first to do a quilting vidcast. I set my mind to it and began publishing the first Vidcast on quilting. The first couple were of me doing demos and then I began to branch out and do some interviews with some of the quilting personalities (Caryl Bryer Fallert, Alex Anderson, Ricky Tims, and lots more). I think one of my best interviews was a chance meeting with Alex Anderson at the airport. I also got permission to do some Vidcasts of some of the world famous quilt shows (IQA in Houston, Festival of Quilts in the UK, and a quilt show in New Zealand). People love being able to see a quilt show halfway around the world. What’s really great is the Vidcasts are FREE on my website and available once a month. If people want to hear when the newest Vidcast is available they can sign up for my email newsletter BonnieMcCafferyNewsletter on Yahoogroups (or just send me an email to be added to the list). The Vidcasts have been a great way to learn to edit video – after all, no one can complain because they are free. I learned that I love filming and editing. Which leads to my next career – video productions. 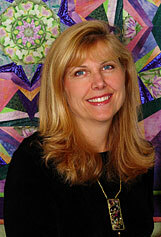 I have been invited to produce video for Quilts Inc. and eQuilter.com. And I have also begun DVD productions. I produced a DVD on my "Painted Face for Beginners", Maggie Davies’ "Hot Ribbon Art", Esterita Austin’s "Painted Peppers", Karen Kay Buckley’s "Hand and Machine Applique the Karen Kay Buckley Way", and our latest DVD production with Sybilla Lenz on "Feng Shui". My daughters and husband are now involved in my company called Dream Mountain Studios where we make videos – web videos and DVDs. I love that my daughters can stay home with their babies and still do some work. Where will this all lead me? Who knows. I’ve become really comfortable in front of the camera and I sure would love to have my own TV show. I’ll just dream of the day when the phone rings and HGTV says "Bonnie, we’ve seen your Vidcasts and you’re great in front of the camera. We want you to have your own show." My english is bad, so I tell you, I like you and yours crafts.